It’s Sunday morning, I tromp wearily down my stairs, into the kitchen and open my refrigerator. There sitting before me in all of their plump and juicy glory are the blueberries I purchased at the grocery store the day before. Ding, ding, ding! Bright idea alert! Let’s use those big, beautiful berries before they go bad! Oh what to make? Well, blueberry muffins of course! I get on line and spend a 1/2 hour comparing 5 different recipes. A couple use butter, a few use vegetable oil, some have milk and one has buttermilk. Now, in my experience I will ALWAYS pick a recipe that gets its fat source from BUTTER over vegetable oil. This is just a personal opinion, but I believe the end product will be a better combination of moist, delicate texture and overall flavor if real butter is used. This narrows my search down to two recipes! So I start reading the reviews on both and one wins out! The proof should be in the title above right?! I made a few modifications as I went and the end result was great! My husband, who is a Betty Crocker Blueberry Muffin lover at heart told me he has never tasted a better muffin! Yes! Betty Crocker gets TRUMPED! My husband also tends to be my biggest critic in the kitchen. So I can always trust that if he goes back for 2nds, 3rds, 4ths and 5ths, I have a quality recipe in my hands! Enjoy! I found that this recipe didn’t actually make a full 24 muffins. For me it made 18. 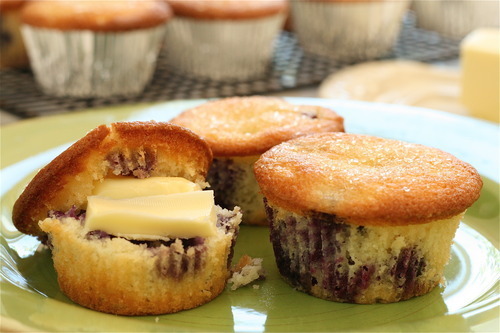 So spray tops of muffin pans with cooking spray and then line with foil or paper baking cups. 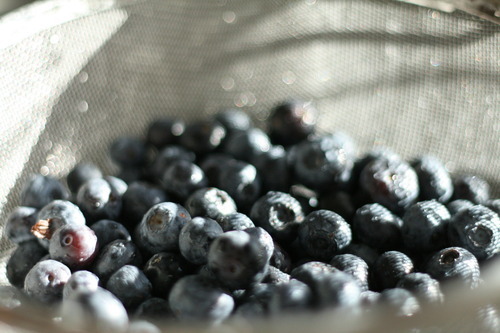 Rinse, drain and dry blueberries. Add and mix until just combined: alternate adding half the flour and baking powder, then buttermilk, and so on. The recipe calls for a full pint of blueberries but I used only 1 1/4 cups. My muffins were still overflowing with blueberries. Probably depends on their size. 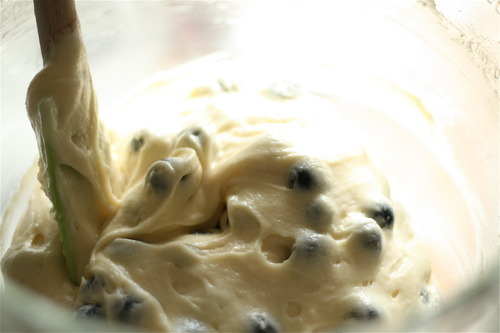 Mix berries with 1/4 cup flour to coat well, then fold into batter. Scoop into muffin tins 2/3 of the way full. Sprinkle tops with raw sugar. (granulated works good if you don’t have the raw. Bake until golden. 25-30 min.